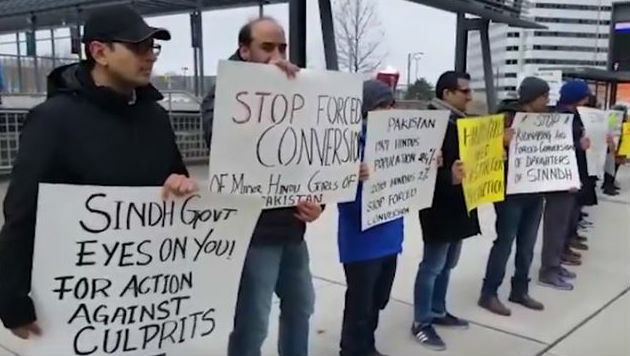 Mississauga [Canada], April 1: Canadian Sindhi Community staged a protest in Mississauga on Sunday against forced conversion and marriages of Hindu girls in Pakistan. "This kind of practice is needed to stop as they are done to the subjugate particular community. I request Pakistani government to take action against this, " said a protester while referring to the forced conversion of two Hindu girls who were allegedly abducted from their home in the Sindh province on the eve of Holi on March 20. Sushma Swaraj Asks Pakistan to Return Abducted Hindu Girls to Family. The demonstrators raised slogans against forced conversion and held placards reading "Stop forced conversion", "Sindh government eyes on you for action against culprits" and "Minorities in Pakistan need constitutional protection. "Forced conversion is a common practice in Pakistan but the recent abduction of two girls have drawn headlines. Several human rights groups have expressed concern over the recent event. Meanwhile, India has also sought suitable remedial action by the Pakistan government to protect and promote safety, security, and welfare of its own citizens, especially from the minority communities. India had shared its concerns through an official note to the Pakistan Foreign Office over the incident. It has been estimated that hundreds of women and girls from religious minorities are abducted, forcibly and converted and then married to their abductors every year. Former vice-chairperson of the Human Rights Commission of Pakistan, Amarnath Motual, noted that 20 or more Hindu girls are abducted every month in Pakistan. The volunteer group, Responsible for Equality and Liberty, also estimate that between 20 to 25 Hindu girls are forcibly converted every month. Pakistan: Two Hindu Teenage Girls Abducted And Forcibly Converted to Islam on Eve of Holi; Sushma Swaraj Seeks Details From Indian Embassy.